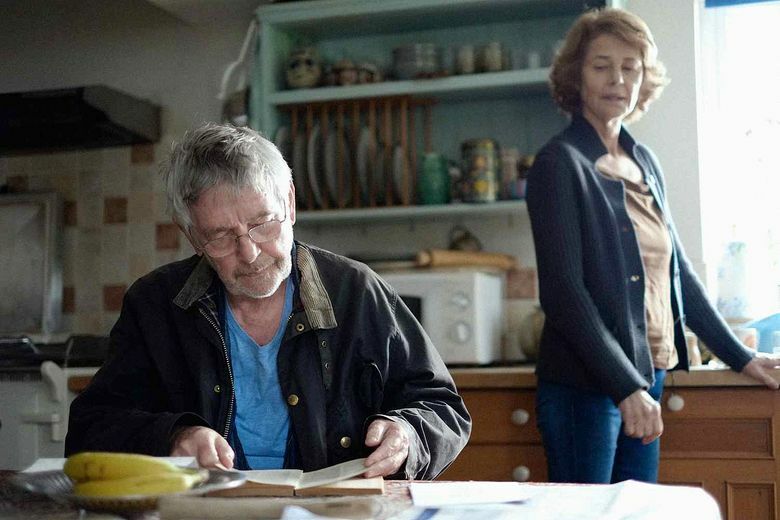 In “45 Years,” Tom Courtenay and Charlotte Rampling play a long-married couple whose anniversary plans are interrupted. Movie review of “45 Years”: An exquisitely painful portrait of a collapsing marriage. Rating: 4 stars out of 4. ‘45 Years,’ with Charlotte Rampling, Tom Courtenay, Geraldine James. Written and directed by Andrew Haigh. 95 minutes. Rated R for language and brief sexuality. SIFF Cinema Uptown. Writer/director Andrew Haigh (“Weekend”) knows that he has gold with the pairing of Rampling (who’s been nominated for an Oscar for her work in this film) and Courtenay, and his camera calmly watches as they tear our hearts in two. Courtenay’s Geoff has a fragility, a gentle vagueness; he doesn’t always seem to see Kate, and doesn’t know what she needs to hear. Rampling’s character, by contrast, is a slow-burn simmer. Watch her, as the story progresses and her smile grows less genuine, her eyes harder, her face masklike — until she boils over with one fierce, unforgettable gesture during the film’s final scene. The disappointment overwhelms her; it’s as if she laboriously opened a beautifully wrapped package, and found only emptiness inside.